For years we've played around with some unique flavor combinations. But, it wasn't until we came across Ghost Pepper that we found a truly HOT flavor that we liked. Ghost Peppers are the hottest peppers in the world, and we've combined that heat with the smoky heat of the Habanera Pepper and the sweet heat of Paprika to create a frighteningly hot recipe. Named after Weeping Mary Road and Weeping Mary Church in Bertie County, our new Weeping Mary's Ghost Pepper Peanuts are a fiery treat that are definitely unique. The Wheeping Ghost Pepper pnuts are awesome! If you truly like it hot, this is your peanut. They have such good flavor and are very tasty with a cold refreshing beverage! The Weeping Mary Ghost Pepper Peanuts...spicy but not over-powering. They have a building and lasting effect. My coworkers tried and enjoyed them! Will definitely buy some more. 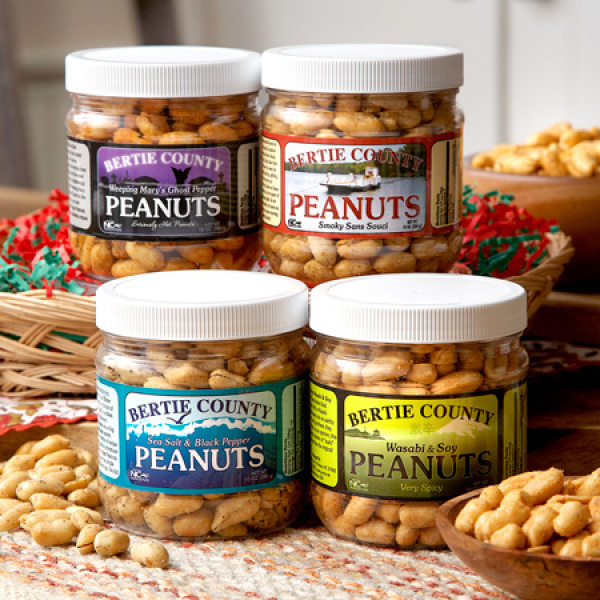 We have long enjoyed the various Bertie County Peanuts products. I ordered the Weeping Mary 30 oz for Christmas, and here we are, out of them by Jan. 3. We just loved them and I'm back to place my next order for a case of these fantastic peanuts. You really hit the mark with the flavor of these peanuts!! I believe this to be the perfect blend of taste and heat. Not over powering. Even my friends I tricked into eating them couldn't stop eating them. They are all around delicious. Thank you! We like the Weeping Mary Peanuts so much we always have some on hand. Nice spicey nut, hot, but not too hot and fresh as can be. Just some of the best i have ever ate. The flavor is just fantastic.The Weeping Marys Ghost Pepper Are not a killer Hot but just there to let ya know that they have a kick! it is hard to stop eating once ya start! My friends and I plan to order more soon! Way to Go Keep it up Good Peanuts! I have a love-hate relationship with your peanuts. On one hand, they are delicious. On the other hand, they burn! I will say they are a tasty snack, great gift, and a necessity around the time your sinuses need some relief. Will be a customer for as long as you make them! These peanuts are very hot, I absolutely cannot eat them with out a cold beer to temper the effects on the taste buds, but cannot stop eating them. They are Terrific. Purchased these for my husband (he loves spicy foods) on the reccomendation of a coworker. He LOVES them! Nice hot bite, but good flavor too. Will be ordering more soon I am sure! I actually got these for my 37 year old son; he's not a fan of really, really spicy food but said all he wanted for Christmas was these peanuts. I bought them for him last year thinking he might like them. He's easy to buy for now. My son-in-law and husband love Weeping Mary's Ghost Pepper Peanuts. Great spicy peanuts with just the right balance of heat. Don't let the label fool you; these are hot but not too hot for an anytime snack. My favorite snack! Great company too! Learn to burn! I buy a dozen at a time. I was introduced to your Weeping Mary peanuts about a year ago and fell in love with them! They have just the right heat but the best thing is the quality of your peanuts. They are so far and away better than commercial brands I can't hardly eat Planter's any longer. While I'm not sure you could improve on your product and I understand why you charge a premium price for a premium product, I do wish that you could offer a more economical shipping cost. Otherwise, I love your product and love your service! Owner Response:Thanks for the kind words! And we agree about the shipping. We are looking for a reasonable answer. Very tasty. Just the right amount of subtle heat. I got the 1st jar as a gift and promptly ordered 4 more. Absolutely delicious! Cannot stop eating them. Spices too HOT for me, did not enjoy as other nuts purchased. I am now on my 5th order of these ghost pepper spiced peanuts, and can't get enough. If you love peanuts and love a little kick, then look no further than these awesome peanuts. I can truly say these are the best spiced peanuts I have ever had. These are delicious, they are hot but not overpowering. Very flavorful. These are too hot for me but my friends who love "hot" things really love these. The spicy flavor and the unique taste have gotten to me. My daughter gave me a jar for Christmas and I have ordered 4 more...twice. Beware, you too could become addicted to these peanuts! I heartily recommend them. Nice large peanuts. These are just too hot for me. If you like hot, these are for you. Weeping Mary Ghost Pepper Nuts!! If you like spicy peanuts, these are the best!!! Sometimes you get food items that say spicy, but they are not spicy at all. These have real KICK!! And they have great flavor. They're not just spicy, they're flavorful too. Don't test taste one or two, and before waiting a few moments just stuff a handful in. They are tasty but they are HOT! Absolutely delicious. In my opinion they are just the right amount of spicy and salty. Excellent flavor - the hot kind of creeps up on you but it mellows out after a few minutes. Which is good because you will definitely want some more! These are terrific, but don't go there unless you are a chile lover that likes intense heat. Fine quality peanuts with a truly fiery spicing. By far the BEST peanuts EVER!!! Our family has tried them all..No one touches Bertie County's Weeping Mary's Ghost Peanuts.. Better Than Ever. I think we have become addicted to the Wheeping Mary's Ghost Pepper Peanuts we like them so much. Sep 29, 2014 | By Lewis G.
Ghost pepper is the hot of all hots. These nuts have just the right amount. If you like heat, these peanuts have an awesome flavor. These peanuts are fresh and high-quality. Great peanuts but the shipping is a killer. Why not use the USPS one price shipping boxes. They are free and the weight for the differing boxes is quite large. They will even drop off and pick up the boxes. Owner Response:We are exploring that option. However, in the past the USPS has not been very reliable with package delivery and tracking of packages has been spotty at best. Additionally, very few of our products fit their boxes. Weeping Mary's Ghost Peppers Peanuts are a hit! Got these originally for my husband. He loves them!. We give them to family & friends for the holidays. Weeping Mary's Ghost Pepper Peanuts are the best spicy peanuts I have ever eaten. I have been ordering these for the last few years (year round) and I love them! Awesome if you like HOT! These things are hot! I love them. Can't each too much at a time until you lose the flavor of the peanut. We add M&Ms and raisins to these and it's awesome. Thank you! Great customer service!! Great peanuts! My Indian son-in-law, a fan of very hot, spicy foods, absolutely loves your Weeping Mary's Ghost Pepper Peanuts. Juzt openex my first jar of weeping Mary's Spicey peanuts. Wow! Ould not stop eating them. They were delightfully spicey, fresh, and wonderfully crunchy. Will be buying them again and again. Terrific ezperience for a true peanut lover! Perfect heat,fresh taste and fast shipment. Will buy again for sure. Will make great gifts. These peanuts are really hot but very good! 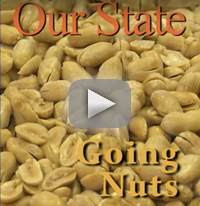 The hot nuts are a bit too salty and the nuts are shriveled up. Not happy with the purchase. Owner Response:Sorry to see that you did not like one of our best sellers. We'll be in touch regarding our 100% guarantee. Delicious! Try them and you'll be hooked. Best peanuts ever. Large peanuts and spicy. I can only taste heat(Cancer) these are the best ! I have searched for and tried many "hot peanuts" over the years. These are the best I have found. Not real hot, but real spicy and very tasty. You will want to enjoy a few handfuls everyday! My son wanted these nuts for his birthday. He really loves them. So they have become a special gift I get him for Christmas & his birthday. Really good tasting spicy hot peanuts. Great peanuts with a kick!! If you're going to stray from the standard Blister Fried Peanuts, the Weeping Marys are tops!!! May 4, 2015 | By Nich S.
I always order the Ghost Pepper nuts and have never been disappointed. Everyone I serve them to say they are highly addictive!! A friend of mine told me about Bertie peanuts so I decided to try them for myself. The Weeping Mary peanuts are amazing. I am buying a case of the 30oz jars every month. The only downside is the shipping price. Other than that the peanuts are amazing. I'm giving 4 stars only because of the shipping charges. WAS DISAPPOINTED THAT THE WEEPING MARY'S GHOST PEPPER PEANUTS WERENT VERY HOT BUT EXTREMELY SALTY. THEY ARE GOOD I WILL ENJOY THEM JUST THOUGHT THEY WOULD BE HOTTER. WILL DEFINATLEY ORDER OTHER PRODUCTS. THE QUALITY OF THE PEANUTS IS EXCELLENT! These peanuts are the best. My favorite healthy, low-carb afternoon snack. Really spicy, and have a little bit of a smoky taste from the ghost pepper, without the florally taste typical of habanero. Get some! Hands down, my all time favorite peanuts! I came across these while searching for spicy peanuts after Mr. Peanut discontinued his 5 Alarm peanuts. I owe that man as I never would have found these! I've gone through multitudes of 30oz jars since. Once started, I cannot stop eating them. I like spicy stuff and these are magnificent! My wife and I love the flavorful spiciness and they are addicting. Bertie County Peanuts are the only peanuts my Grandchildren enjoy. Just hot enough to surprise you the first time but not so hot that you don't keep eating. These are just right with a little heat on the back end. This is your best product in my opinion. I love these ghost pepper peanuts. The heat is just right and the flavor is out of this world. Thank you. My son loved these. He loves all his food spicy and hot. weeping mary ghost pepper peanut are my husband's favorite so I got some for him for valentine's day! Discovered these at a business function and the flavor combination here is so incredible you just eat and eat them. Possibly the best peanut I have ever eaten. Great peanut flavor. These peanuts are HOT with just the right amount of burn. First off, I love your products! Though they are pricey I am so addicted to them that I can't eat Planter's or any other peanut. Now for the concern. On my latest order I failed to initially change the "Ship To" to my new address. Totally my fault. I caught this the next day but your office had already closed. I called your shipper, FedEx, and explained my situation. They said you guys would need to call them the next day to have the package re-routed. I called the next morning and spoke with a very nice lady. She contacted FedEx and called me back to say the package would be re-routed. This did not occur. I called FedEx to complain and got no satisfaction. I ended up having to drive to the old address to pick up my order. While you guys did everything you could I wanted you to know about the worthless service your shipper provided. One of the reasons I don't order from you more often is the price of shipping. I am still displeased with FedEx on this one. If I could find a regular source here in Raleigh for my preferred Weeping Mary's I would buy them and avoid the shipping but I have been unable to locate a source. I'll give your product a 5 star rating but the shipper gets a negative 5! Owner Response:Thanks for letting us know about the problem - we're looking into it now. And, we're glad you like the Ghost Pepper Peanuts! Owner Response:We're looking into other options for folks who don't mind waiting several days. Stay tuned! I love every peanut selection by Bertie County but my absolute favorite are the Weeping Mary hot peanuts! Tasty and a solid zing. The heat keeps my consumption moderated too. If you like spicy-hot you will love these. I found these nuts on an out-of-town trip a couple of years ago and they have been on my mind ever since. They are spicy while still being delicious and nothing else compares. I have been ordering them ever since! I bought a jar of the weeping Mary's had them eaten within the day had to go back and order 4 more and my friends liked them so much they took mine. These are the best hot peanuts I have ever had. As always, LOVE your product! Your peanuts are so good that I can no longer eat Planter's or other national brands. My only complaint is your shipping costs but I'm guessing there is not much you can do about those when you are having to deal with the sharks at FedEx! Weeping Mary Ghost Pepper peanuts are the best. I brought some in to work and 30 oz were gone in two days. I can't wait until I can get some chocolate covered ones. Weeping Mary's are a hot & spicy delight! These are the best peanuts I've ever had, they're addictive. They're hot but not too hot. My family loves these fabulous peanuts. The quality is excellent and consistent. Great service,too. Thank you Bertie County Peanuts! I have been buying spicy peanuts for years, with all the brands tried they have been left wanting. Came across these GHOST PEPPER several months ago and am sold on them. I'm hispanic and I enjoy hot food, and these are the hottest I ever found. If you enjoy hot food I highly recommend these. Your products are peerless, second to none! But, as I have noted in other reviews, your shipping costs are ridiculous! Keeps me from ordering unless and until you put the Weeping Mary's on sale! I know there is a cost to ship stuff, just wish you could make that burden a little easier on your customers! I will rate the product as "5 Star" but the shipping costs get a negative 5! Owner Response:We agree 100%! Unfortunately, as a small family business we don't receive the sweet shipping deals of the large, multinational companies. We simply pass on the charges with no attempt to make any money off the shipping. Additionally, we review our shipping charges and contracts each spring. Thanks for your thoughts! Flavor is good but I doubt if pepper is ghost. They are just not that hot. The quality and flavor of these peanuts are outstanding! Great gifts for the hard to buy for! Best peanuts I ever had. If you like it hot this is a must try! The peanuts we're amazingly good. Will def buy again. I love spicy foods BUT I want them to taste good also. These peanuts fill that bill and then some. Absolutely, positively, without reservation the best spicy peanuts I've ever had. Fresh, crunchy and oh so fabulous. You won't go wrong! Perfect level and type of "heat", addictively hot. Loved by everyone I give a jar to. Ghost Pepper Peanuts are the best....I ordered a case this time! I love these peanuts! Cannot get enough of them! Just ordered 3 more jars. If you love spicy, you will love them! Best Hot Peanuts ever! they really do have a kick to them! I buy them for all the guys in my family. They love them! The peanuts were delivered 9 days after the order was placed. I like spicy food and for me the peanuts were spicy, but not to hot. Their is no lingering burn so don't worry that your mouth will be on fire afterwards. My only negative comment is that they are too addicting and I could finish the entire jar in a day, if I wasn't watching my caloric intake. I will definitely order them again. Great taste and awesome peanuts. Definitely recommend for the spice peanut lovers. If you like hot peanuts then you'll love Weeping Mary's Ghost Peanuts. My shipment of two 30 oz. jars of your wonderful Ghost Pepper arrived one jar short. Someone had gotten into the box and stolen it. It had to happen at either FedEx or USPS, because FedEx consigns the shipment to the post office. I called Bertie Cty and told them my situation and they agreed to ship me another 30 oz. jar for free. THAT IS WHAT I CALL GREAT SERVICE!!! Thank you so much guys! I love the peanuts. My favorite of all of your offerings...can't keep them around! This has to be your best product! I like several others, but your Ghost Pepper peanuts are the finest. Thank you and don't ever stop making them. Very interesting flavor on excellent peanuts- hot! Beautiful combo of these hot pepper spices on your high quality peanuts. Nice burn also after a handful. Suggestion- make a Carolina Reaper version to pay homage to the Carolina's own super hot pepper! You know how you want just a bite of something and you don't know what? Well these little darlings are not it because I defy you to eat just one..handful. Perfectly roasted and dusted with something wonderful. Enough zing to let you know you are indeed still very much alive without being punishing. Also adds a nice subtle sweet pepper taste. Try them. Not only will you love them but you will have found the perfect gift to give that person you want to impress but don't what the heck to buy for them. These are the best peanuts I've ever had. Especially the Ghost pepper. Everyone in the family loves the Ghost Pepper nuts even those folks that hate hot stuff. They are addictive!!! Cannot live without my weeping Mary! I refuse to eat any other peanuts.... if it's not Bertie county thenits not happening. Bertie county weeping Mary's have turned me into a peanut snob. I usually order 2 jars at a time, one for home and one for work- his time I ordered the case, they've mad an addict out of me! BEST damn peanuts in the world!!! I discovered these peanuts at a food expo at the convention center in New Bern a few years ago, and tasted them. I was hooked from that moment. There is no peanut anywhere on the market that comes close to these in terms of flavor, quality, size of the legume, or heat and spiciness! I've tried every other hot peanut around, and these are the very best. It's a shame they're hard to find at local retailers, and your shipping costs are pretty high, but I'm seriously hooked. Every time I come through Windsor I stop and get a couple of jars if your store's open. When I run out and I'm not traveling, I order two 30 ounce jars at a time. I love these things -- best snack ever. Thank you, Powell & Stokes! Please never stop making these. As always, and I have ordered and enjoyed these peanuts for a long time, I loved my recent batch. But the main reason I wanted to write was to tell Bertie Cty how impressed I have been with your customer service. A couple of months back I received a package that was sent via FedEx and then through the post office. When I opened it, one of my 30 oz jars was missing. I called Bertie and the agreed to ship me another completely free. Wow! In my recent batch, I ordered (6) 30 oz jars on a Monday. I paid no extra shipping and went with standard. I could not believe it when they showed up the very next Thursday...and they were all there this time. Thanks Bertie Cty. You guys and gals are GREAT! Best peanuts on the market. Nice and crunchy and very flavorful! The Ghost Pepper is hot but IMO not overbearing. Just Right!! These are literally the best peanuts I've ever had. Big and crunchy with some spicy ghost pepper and habanero powder sprinkled on the surface. Not the hottest peanuts I've ever had but a really good level of spiciness if you like that sort of thing. These are some of the best peanuts I've ever add, absolutely addictive. The heat level is just right, not so hot that you can't eat a good sized portion. The texture of the peanuts is great too. I will definitely order more in the future. Love the Mary's, hate the shipping! As I have noted in previous reviews, your products are just the best. I can't even eat another peanut product at this point because they are all inferior to yours. But, as I have also shared, the shipping of the products is a negative experience...too costly and too slow. From what I can tell from the latest tracking, my shipment went from you to FedEx, which took the package all the way to Kernersville, where it sat a couple of days and then was finally delivered by the USPS. I'm not sure why FedEx couldn't deliver directly to me here in Raleigh, which is obviously on the way between your facility and Kernersville? Giving the product a 5 Star rating but a 1 star for the shipping cost and experience! Great Peanuts with a nice "kick" to them. One problem....they go too fast! Keep up the great work. Gave my neighbor 6oz. 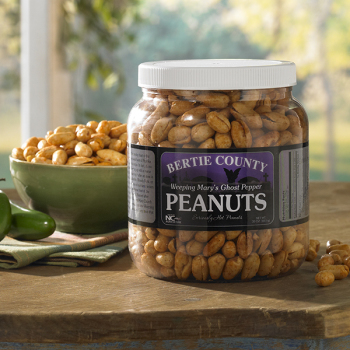 jars to sample, along with your catalogue in hopes they will lie the peanuts and order from Bertie County Peanuts. I order Ghost Pepper peanuts all the time and usually FedEx delivers right to my door. For some reason, this last time, the driver was lazy and left my pkg. 1/2 mile away at our bank of mailboxes. The box was left out in the open where rain could have soaked it or someone could have stolen it. THIS IS UNAACEPTABLE. But I love the peanuts. Tried a jar while in NC and just had to get more. They are very good! Always very fresh tasting with the exactly right amount of heat! We do mail order and the process and delivery is always easy and quick. Weeping Mary peanuts good enough for me to re-order for me and buy some for Christmas presents for family and friends. I buy the ghost pepper nuts for all the men in my family. They love them and expect them for birthdays and holidays!! Very flavorful. Not as hot as I thought but still very spicy. Ordered these for my husband because he spoke so highly of them. I tried them, fearing the 'heat' but they were not that bad. Hot yes, but not unbearable! Loved them! We sent a couple jars to friends of ours in Arkansas as well for Christmas, the husband called saying they were the best peanuts in the world. The peanuts made my husband happy and certainly served as a delightful gift for friends during the holiday season. Very happy with our purchase! Great... just right amount of heat. Jan 9, 2018 | By Mark S.
Tried the Ghost Pepper Peanuts and they are fantastic! We love peanuts and the added kick is delicious! My family loves them! They're a perfect late night snack with a beer. These are good, but very spicy. If you like hot you will like them. Discovered your peanuts while in Wilmington NC. Got hooked immediately. We vacation in Topsail frequently. Live in PA and work in OH. The guys I work with went "nuts" when they tried the Weeping Mary ones. This is the favorite one up here. We now have group orders in bulk and its growing. All your peanuts are top Quality , the taste is so good, I can't compliment you enough. Since we order in bulk, the shipping costs are very reasonable and the shipping time is great. So glad we discovered your product. I love the weeping Mary spicy peanuts and when my jar gets low I will be ordering more. They are too hot for most of my friends so less sharing and more for me! I can only eat a little at a time but they are delicious. I will buy other types of Berties peanuts for my friends and family. Fast shipping. Delicious peanuts. Shared with friends and family. We are addicted! Fantastic. Will be ordering more. I have already eaten half the container . Weeping Mary's Ghost Pepper Peanuts Addictive & Awesome!! Weeping Mary's Ghost Pepper Peanuts have ruined me for any and all other peanuts. Can't beat that flavor! My husband and boys love anything hot and the ghost pepper peanuts are the best. They fight over them. Best Peanuts Money Can Buy! The Ghost Pepper peanuts are my husband's most favorite! All flavors - Great Nuts. Try them folks they are Amazing! This is about my 6th order of Weeping Mary's Ghost Pepper Peanuts. So yes I love them! These peanuts are amazing! My mouth is still on fire! I love these peanuts I put them out at all my parties and my guests love them as so do I, If your looking for a peanut with some kick these are the one's. Absolutely love these peanuts---they are very fresh and the heat is perfect. I'm a repeat customer and the product is consistent---free shipping this time a welcome added bonus! I have ordered the weeping Mary peanuts in the past and I think they were hotter. I don't know but it is like the powder did not bond to the nuts. In the past I would give five stars but I can't for this shipment. These peanuts are great. Be sure to have a beverage when you start. It's hard to stop eating them once you start. I buy these for my husband, and he LOVES them!!! I've tried a lot of spicy peanuts, but the Ghost pepper from Bertie County are far above all of them! I love them, I always stop down ad visit whenever I'm in the North Carolina area. We started getting the ghost pepper and spicy unshelled peanuts because our local BBQ place was serving spicy peanuts and we loved them. 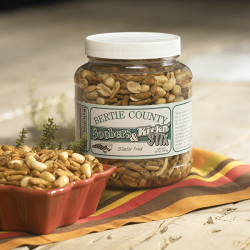 Bertie County had the best selection of spicy nuts so I ordered from them and loved them. This is now our 2nd order and we will keep ordering in the future. If you like spicy nuts, get them here. They rock. These were purchased for a friend of mine who considers himself a expert on all things hot pepper-wise. Will let you know how he weathers the hot pepper trail. Awesome peanuts, great customer service! My son-in-law loves the spicy peanuts I get for him....and I love all of the others!!! I love the Weeping Mary's but this batch seem a bit chewy or not as "crisp" as all of my previous purchases of Weeping Marys. Very good taste. Not too hot if you like hot. The peppers give a great kick to the peanuts. My son was so happy with the 10 oz. jar I gave him that I sent him a 30 oz. jar after Christmas. He was very glad! Actually, I'm reviewing on my husband's behalf who LOVES these Weeping Mary peanuts. He ate 1/2 of the container in one sitting, saying that they are addictive they are. I saw these & knew I had to get these for my boyfriend. They are delicious! This is the first time ordering from this company & it will not be the last! 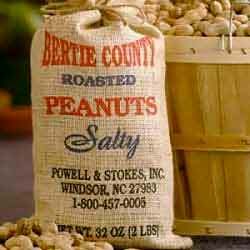 Having been a Bertie County Peanut fan for a while now, all I can say is keep it up! Always on time, always fresh, always delicious! Great peanuts especially kettle cooked. Great crunch and heat. My work team and I bought a case of these to snack on at work. We love them! Cant get enough. Shipping was quicker than I expected. The first time I tried these they were a gift. Loved them so much I had to have more. Not too much of a kick but enough that keeps me from eating the whole jar in one sitting but at the same time makes me go back for more!!! The most delicious peanuts EVER! !